Flower's Cove (or Flowers Cove), located on Route 430 in western Newfoundland, is a pretty but unassuming coastal town with a very special attraction—thrombolites. These formations, found along the coast, were created when microbes in the ancient Iapetus Ocean photosynthesized their food. Because the water near the shore contained calcium carbonate from limestone rocks, this photosynthetic process created the unusual formations we call thrombolites. Thrombolites are typically several feet across and look something like an Italian panini rosette roll made from rock. 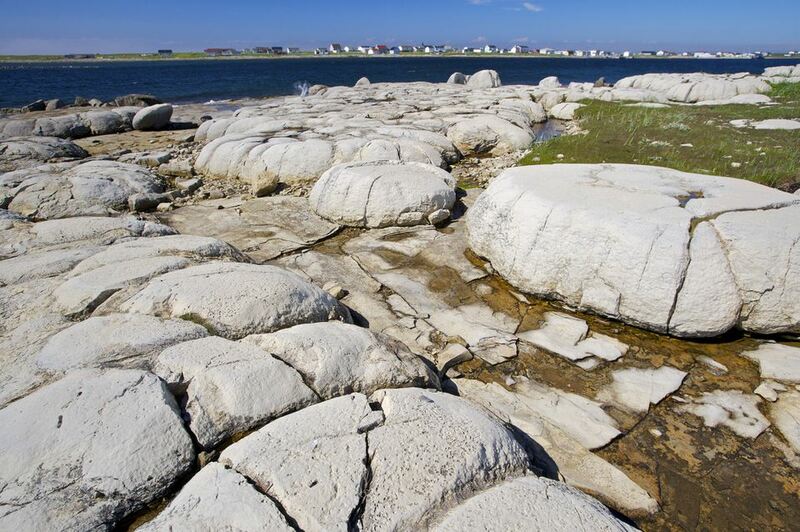 Scientists describe thrombolites as "clotted" structures because thrombolites lack the layered structuring of strombolites, which are formed in a similar way and date back to approximately 3.5 million years ago. As you look at a thrombolite, it can be difficult to imagine how living organisms could absorb enough minerals from the water to create such a large, rocky formation. Thrombolites exist in only a few places on Earth. The thrombolites of Lake Clifton, Australia, are similar in appearance to those found at Flower's Cove. Most thrombolites at Flower's Cove have a circular center surrounded by sections that resemble curved slices of pie. Some have fallen apart or broken up over the years, but you'll find plenty of intact thrombolites to view. Flower's Cove is a good place to stretch your legs during your drive on Newfoundland and Labrador Route 430 from St. Anthony or L'Anse aux Meadows to Rocky Harbour. The trail is quite short and easy to find. When you reach Flower's Cove, you can get to the thrombolite formations by parking off Route 430 (you will see a small, marked space where you can pull off the side road to park) near the beginning of the boardwalk to Marjorie's Bridge. This covered bridge is easy to see because it features a red roof and a large identifying sign that indicates the direction you should walk in order to find the thrombolites. Take the boardwalk and follow it to the beach path. To make the walk shorter, park at the white church north of the bridge on Route 430 and walk across the grass to the path. Turn right on the path and follow it to the thrombolites. The trail is a boardwalk across marshy areas and a gravel path along the shoreline. It is relatively flat and easy to navigate. If the weather is nice, pack a picnic; you'll find a few picnic tables near the water where you can eat and enjoy the view. There is no admission charge.